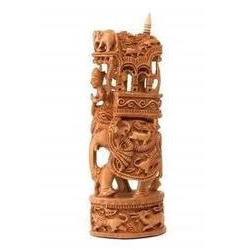 Prominent & Leading 100% Export Oriented Unit from Jaipur, we offer sandalwood ambari, wooden ambari, sandalwood elephants ambari statue, wooden chatter ambari, wooden carved chattar ambari and wooden elephant ambari. Wooden Ambari, white wood ambari , wooden ambari with huntering, wooden houdah. This White Wooden Ambari is one of the traditional product. It is made by white wood. This wooden ambari made by master craftsmen in Rajasthan. Mahout sitting atop the elephant who is looking very beautiful view of it is a festival. The howdah has been made by the victim. The wooden howdah of different sizes are created in the howdah. The 12 "inch, 18" inch, 20 "inch, and is to come. Howdah good workmanship and cleaning it is created. we are provide to our client to mast competitive prices. 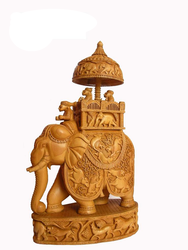 By our rich industry experience, we are committed towards offering wide array of Sandalwood Elephants Ambari Statue. This statue is designed using quality assured sandalwood and sophisticated tools in compliance with set industry standards under the supervision of skilled professionals. Our offered statue is available in various colors, designs, patterns and sizes. We offer this statue at market leading prices to our clients. 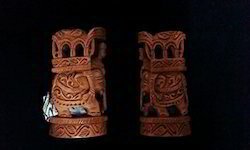 Moreover, this statue is thoroughly tested on various stages by our skilled professionals assuring its flawlessness. We are offering a wide array of Wooden Chatter Ambari which is reckoned amongst the clients for their appropriate designs and exceptional patterns. Besides, this range enhances the beauty of the place where it is placed. Moreover, our range found vast application in homes, offices and various other places. As well, customization of this range is also offered from our end in order to meet the diverse requirements of the clients. Our clients can avail form us a wide assortment of Wooden Ambari. This range is recognized as it is available in plethora of patterns, designs, shapes, sizes and colors. Termite resistant our range is highly praised by the clients for its quality and easy availability. Moreover, this range is recommended by the clients for its durability and reliability. Our range possess fine finish and luster. 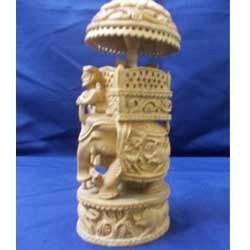 This Wooden Carved Chattar Ambari is one of our wooden handicrafts product. 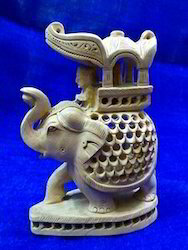 This Wooden Carved Chattar Ambari is made by white wood. 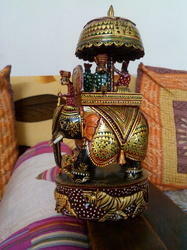 It is made by master craftsmen in rajasthan. Available in all sizes. 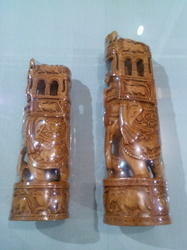 This wooden chattar ambari houda product is goods statues. This wooden chattar ambari houda used to home and office decorative statues . we are provide to our competitive price. Packaging Details: packing in bubbles .